Use the Jeffrey Court Concorde Dawn 3 in. x 6 in. White Ceramic Beveled Wall Tile alone or combine it with complementary glass, stone or ceramic field tiles (sold separately) to create a stylish, personalized enhancement for your home decor. This white-colored tile features a glazed, smooth surface and a uniform appearance in tone to create a handsome, contemporary look that nicely complements a variety of decorative schemes, and a semi-vitreous water absorption rating makes it tile a great choice for a wide variety of projects. 1 square foot per pack, 8 pieces per pack. Pack weight is 3.1 lb. Buy online Jeffrey Court Allegro Beveled 3 in. x 6 in. 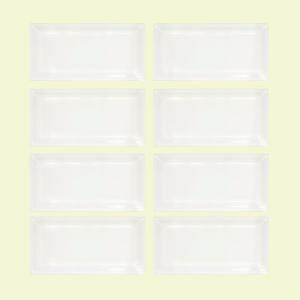 x 8 mm Ceramic Wall Tile (1-Pack/8-Pieces/1 sq. ft.) 99507, leave review and share Your friends.